Numerous FPBO samples will be send around between the partners over the course of the four-year Residue2Heat project. 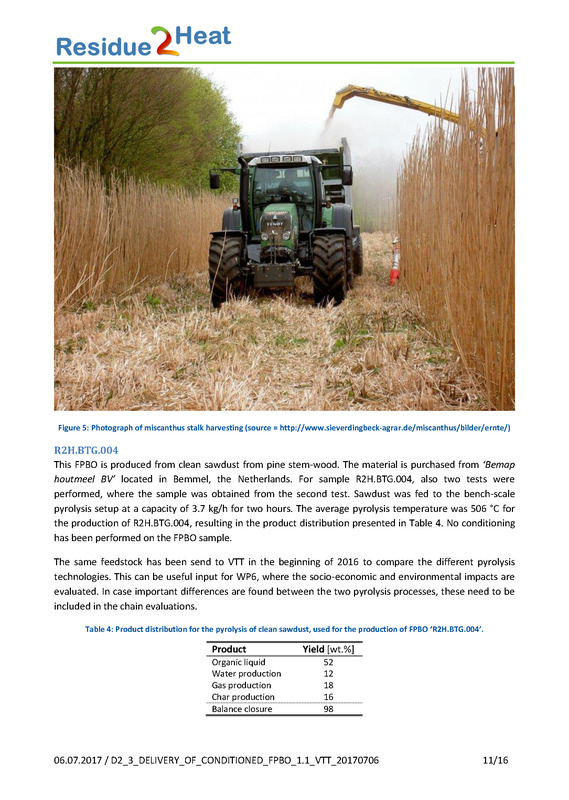 Sample delivery is a joint task, partners VTT and BTG will supply the consortium with (conditioned) FPBO samples. The sample delivery will be described throughout the project in seven deliverables (D2.2 – D2.8) and is connected to Task 2.1. To have a full overview, each deliverable report will be an updated version of the previous one, rather than a new report describing only the delivery in the relevant reporting period. A detailed analysis on the production of FPBO from different biomass and processing conditions will be documented in D2.1 (due in M26). Details on the analysis results of the various samples send to the project partners will be performed in T3.1 and its related deliverables (D3.1-D3.8) which will provide feedback for WP2, and will be employed in WP4 and WP5 in modelling and utilization. Both D2.3 and D3.2 are primarily used for Residue2Heat internal documentation although they are marked as public. For the project partners it was essential to receive a documented pyrolysis sample as soon as possible. The follow up deliverables will include more details and analysis concerning benchmarking of processes, comparison of data between VTT and BTG, the performance of measures to lower the water content (related to T2.1) and phase stability, aqueous effluents. – 10 kilogram of ash from the fast pyrolysis of clean wood has been send by BTG to UIBK for activities in WP6 (April 2016). This entry was posted in Deliverables and tagged bio-oil, Christian Lindfors, D2.3, Evert Leijenhorst, FPBO, Pyrolysis. Bookmark the permalink.